The wind section of the Trondheim Jazz Orchestra sounds an ominous warning on ‘Something New’ as Kim Myhr’s gentle folk ruminations attempt to ameliorate the tension. Jenny Hval’s voice is put to the same use as 2015's lauded album, Apocalypse girl, vocal musings that seem private, wrought but taciturn in meaning. I liken Jenny Hval’s more avant tendencies to Annette Peacock, and her edgy narratives. The difference being that Hval has an inherent prettiness about her voice whereas Peacock was almost wilfully off-key; often a banchee cry. The similarity is that Hval, like Peacock, uses her voice an as instrument to convey emotion in its purest form, rendering the words almost superfluous. 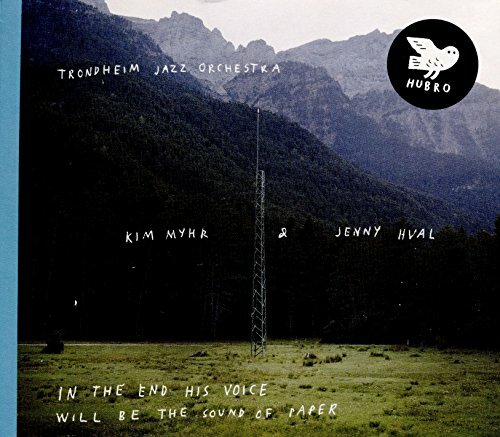 In the End His Voice Will Be The Sound of Paper is a breathtaking piece of musical theatre, for me an extension of my periodic interest ín modern classical music, or chamber jazz. The fascinating aspect of this work is Kim Myrh’s acoustic guitar, and its ability to skirt playfully around the minor-key orchestral picture, so that what you’re listening to sounds like an avant garde update of John Fahey’s folk compositions. The piano and horn section play in fits and starts, the latter often sounding out alarms in the manner of a foghorn, the former hammering some fidgety percussion. The effect reminds me of the music from Richard Strauss’s Salome or Bartok’s Bluebeard’s Castle, the music carrying a narrative expectant of calamity. In The End His Voice Will Be The Sound of Paper is however replete with moments of real beauty, inscrutable mystery, and unnerving ticks in equal measure, and a careful listen will reward the open-minded listener over and over again, particularly those readers with a penchant for ambience, dark minimalism, or 20th Century Opera. I can also imagine anyone who enjoys listening to drone, or to nu-folk, or modern classical, deriving enjoyment from the work. It will probably reach few people, but it’s the type of experimental music leading the way to the exploration of new musical frontiers.